Have Kookaburra named this stick Lithium because like a battery, if you carry a Kookaburra Lithium you will have tonnes of energy? As the desire for lighter and lighter field hockey sticks becomes more, Kookaburra go from strength to strength with the Ultralite range. Strength is a great place to start the review, like anyone who has ever sat a science lesson, you might think that Ultralite means ultra weak. Weighing 515g (yes, 515g for a 37.5” hockey stick, light hey!) the Kookaburra Lithium is super light but surprisingly powerful. Don’t get mislead, you obviously loose a little brute strength because of the weight but this 2015 edition of the Kookaburra Lithium has been upgraded to now include the Tri-Core structure and hits the ball great. Through my experience I’m actually preferring lighter sticks now, what you loose in weight behind the ball when you hit, you gain in swing speed and the two nearly balance themselves out. What benefit does such a light hockey stick have anyway? Well we mentioned swing speed, which is great, technically the lightness of the Kookaburra Lithium has a number of advantages too. 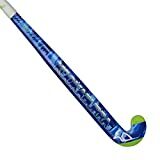 Because this Lithium Ultralite is so light you hardly notice you’ve played with it after 100 minutes, in comparison to other hockey sticks anyway! It is also so easy to move this stick around, particularly when dribbling, you can change from open to reverse quickly, in-fact you might have to learn to slow yourself down a little. Another huge benefit for me was the improvement hitting on the reverse side. This comes back to swing speed, I personally have to swing much harder and faster to get the same hit impact on reverse as I do on the open side. The Kookaburra Lithium makes this effortless. Reverse side hits are then enhanced by a couple of the amazing features to review about the Kookaburra Ultralite Lithium. The Lithium has Kookaburra’s ‘Precision Edge’. They have made the reverse hitting edge flatter giving you so much more room to connect with the ball, it really is nice. Backed up by the Kookaburra reinforcement, I would say the Kookaburra Lithium is one of the best reverse side hitting sticks of 2015. As you read through the features, there is so much to review about the Kookaburra Lithium, they really have gone to town on this Ultralite model in 2015. Composite 95% carbon content enhanced with fabrication, nano technology and 5% fibreglass. Abrasive KCF on the face of the stick, soft feel stuff going on to help bring the ball under control. The only disappointing thing about the stick for me is this ‘soft feel’, it’s good for bringing the ball under control but you loose a bit of that ‘ping’ sensation when you hit the ball. This stick does not feel like some other 95% carbon sticks, it’s softer. And you can’t leave a hockey stick review without talking about the shaft shape. The weird but strangely nice Mbow 2 shaft on the Kookaburra Lithium needs to be experienced. Compared to what we are all used to, bows getting lower and lower, the Kookaburra Lithium has a big curve, 24.5mm, high up the stick at 380mm. It feels great to be honest and unless you are mental about flicking it actually gives a great curve right through the stick and an excellent balance point. In summary of the review, the Kookaburra Lithium is light, fantastic for dribbling and reverse hitting. It has more power than you would expect and all-round would be a great purchase for someone looking at this kind of spec. Check our dedicated page on Kookaburra hockey stick technology for more information on what all these acronyms mean. Still not sure? Jump back to all our hockey stick review on the main page and maybe start a hockey stick comparison chart using our exclusive tool.